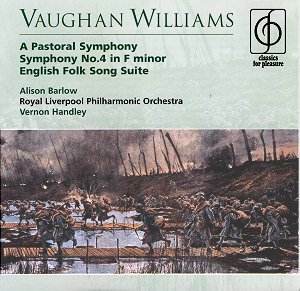 Back in my early teens when I was eagerly discovering the Vaughan Williams symphonies for the first time I acquired a copy of André Previn�s recording of the Pastoral with the London Symphony Orchestra on RCA. Although it was some time before I fully understood how fine the performance was it was a recording I grew to love. Some years later when I took the momentous decision to dispose of my vinyl collection to fund the purchase of a new compact disc player it was to Handley (then on EMI Eminence) that I turned as a worthy alternative. Sadly (and inexplicably) the Previn recording is not currently available and in its absence, although there have been a number of recordings released in recent years, Andrew Davis, Leonard Slatkin, Roger Norrington and Bernard Haitink amongst them, this Handley reissue at super budget price still leads the field and is also an outright bargain for good measure. The beauty of the performance stems from both the sublime playing Handley draws from the RLPO and his own innate understanding of this most personal of VW symphonies. The rapturous surface beauty of the music is there sure enough but Handley never loses the feeling of profoundly felt grief and loss that underpins the score; the composer�s poignant response to lost friends, amongst them George Butterworth, and his journeys "night after night with the ambulance wagon at Ecoivres when we went up a steep hill and there was a wonderful Corot-like landscape in the sunset". Handley�s performance never fails to send a shiver up my spine, exploiting the wonderful transparency of the composer�s scoring with consummate artistry. Try the majestically haunting climax in the first movement from around 4�20", or the opening of the Lento moderato with its dreamily distant horn solo and misty strings. It is hard to imagine a more palpable sense of atmosphere. The off-stage natural trumpet solo in the same movement, inspired by the sounds of a bugler practising across the battle fields, is both ethereal and deeply moving and when it comes to the Moderato pesante third movement Handley manages to balance a fine sense of dignity with the movement�s more lively dance like material. Here, as elsewhere in the work, the horns of the RLPO are exceptional, underpinning the textures with highly impressive solidity. I still eagerly await Richard Hickox�s account of this work as part of his unfolding Chandos cycle (his already released Fifth is particularly fine) but it will have to go a long way to replace Handley at the top of my current list. Whereas Hickox�s Fifth is up there with the best; his most recent release, the Fourth, left me with somewhat mixed feelings. Although the LSO play superbly for him the brisk tempo he adopts for the opening Allegro does not allow the players to invest the music with the sheer menace and venom that Handley captures with such an admirable sense of drama. Conversely Hickox is possibly the only conductor (at last!) with the courage to take the final movement at the breakneck tempo the composer himself adopts in his vintage recording of 1937 (available on Dutton and coupled with Barbirolli�s Fifth of 1944), a point that had me cackling with glee when I heard it for the first time. It is not just the menace of the opening movement that Handley captures so impressively but also the desolation of the closing paragraphs with its beautiful, lingering flute solo. The horns, once again, are quite superb (take a listen at around 2�28") and conjure up one of my most enduring memories of Handley conducting Vaughan Williams when, at an RPO performance of the Fourth sitting in the choir stalls, I recall Handley�s face in this passage, grimacing and even laughing at the horns in his efforts to goad them on. His pacing of the Andante moderato is brilliantly judged and once again aided by atmospheric playing from the orchestra whilst the biting, at time maliciously cackling Scherzo, is brimful of energy and dark mischief. Having mentioned that if there is a disappointment in Handley�s performance it is the opening of the final movement, the towering ferocity the music gathers through the final con epilogo fugato is second to none, culminating in a conclusion of shattering devastation and power. I will always retain a deep affection (if it is possible to be "affectionate" about the fourth) for the composer�s own reading of this work but whilst Hickox and Haitink both have their clear qualities, it is Handley once again that I return too most frequently. The lively account of the English Folk Song Suite, Gordon Jacob�s orchestration of the composer�s original wind band score that opens the disc, is almost unnecessary in the company of the symphonies but makes an attractive opener and filler, giving the disc a very generous playing time of nearly seventy eight minutes. I suspect that there cannot be too many ardent Vaughan Williams admirers who do not already own Handley�s symphonic cycle but if not then this disc is an essential purchase. Happily for the newcomer, it�s also a fine introduction to the breadth of the composer�s symphonic oeuvre, both in terms of its price and quality of performance.